Precisely what goes on in the strange land where the Teletubbies reside could reasonably take an entire archeological team the bulk of their lives. It is one part unpredictable chaos, one part cute education... and at least one part strange. But, when you live in a place where you're woken up by the gigging smile of a sun with a baby's face, who can blame anyone for having some odd behaviors! Still, with a sun that big, it is important to protect those eyes. How else will they watch those shows that beam out of their bellies? Keep those eyes protected and the smile wide when you slide this pair of Teletubbies Tinky Winky Sunglasses on your face. These officially licensed sunglasses offer all the UV protection you'd expect from the shatter-resistant lenses while transforming you into a character from the show. Other folks can even look into your eyes and see themselves! No one else has ever been really sure just what a Teletubby sees through their seemingly rose-colored glasses. 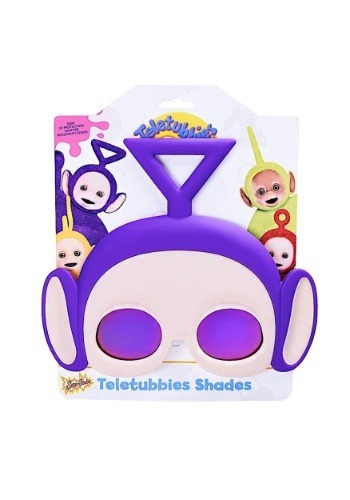 Well, turns out that they are actually mirrored amber ones and you can see just like Tinky Winky with this pair of Teletubbies themed sunglasses.